Americans are very concerned about illegal immigration but ambivalent about what to do about it — especially the 11 million aliens currently in the United States illegally. Frustrated with the federal government's failure to secure the borders, several states passed laws allowing state and local police to check the immigration status of suspected unlawful aliens. 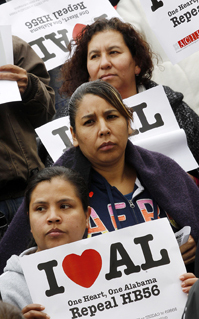 Civil rights organizations warn the laws will result in ethnic profiling of Latinos. The Obama administration is suing to block several of the laws for infringing on federal prerogatives. Advocates of tougher enforcement say undocumented workers are taking jobs from U.S. citizens, but many business and agricultural groups say migrant workers are needed to fill jobs unattractive to U.S. workers. Two years ago, the U.S. Supreme Court upheld an Arizona law providing stiff penalties for employers that knowingly hire illegal aliens. Now, the justices are preparing to hear arguments on the controversial, new Arizona law that inspired other states to crack down on illegal immigration.